7.2.1898: Launched by Edwards Brothers, North Shields (Yd.No.580) for The Hartlepool Steam Fishing Co Ltd, West Hartlepool as ANNIE. 3.1898: Completed (Charles H. Ford, manager). Registered at West Hartlepool (HL53). 1899: Sold Fiskeri-aktieselskabet Isafold (Isafold Fishing Co Ltd), Iceland. Renamed DALANES. 1900: Sold to Joseph Brown, Newcastle-upon-Tyne. 1901: Sold to James Herbert Marr, Hull (managing owner). Fishing from Fleetwood. 5.7.1902: Mortgaged to Williams Deacon’s Bank Ltd, London (A). 1904: Sold to J. Marr & Son Ltd, Fleetwood (James H. Marr, manager). Renamed ANNIE (NE1). 28.2.1905: Registered at Fleetwood (FD28). 1905: Sold to Tejero, Marimos & Co, Corunna for £3350. Renamed GERÓ. 1924: Not in Yard List under any name. This entry was posted in Steam Trawlers and tagged James Herbert Marr, Marr on May 17, 2012 by Fred Smith. 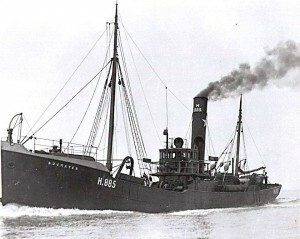 16.2.1892: Launched by Cook, Welton & Gemmell, Hull (Yd.No.83) for Pickering & Haldane’s Steam Trawling Co Ltd, Hull as ACTIVE. 8.3.1892: Registered at Hull (H191). 26.2.1906: Re-registered at Hull (H191). 18.1.1909: Sold to Thomas R. Porter & Benjamin J. Ridge, Newlyn. 1912: Sold to James Herbert Marr, Fleetwood. 10.5.1912: Sold to The Active Fishing Co Ltd, Fleetwood (James A. Robertson, managers). 19.11.1912: Registered at Fleetwood (FD157). 5.10.1916: Sold to Horace E. Stroud, Aberdeen. 26.3.1917: Registered at Aberdeen (A776). 26.4.1917: Stopped by U-boat (UC50) 65 miles E by S of Longstone Light and scuttled. 14/05/2012: Page published. 5 revisions since then. 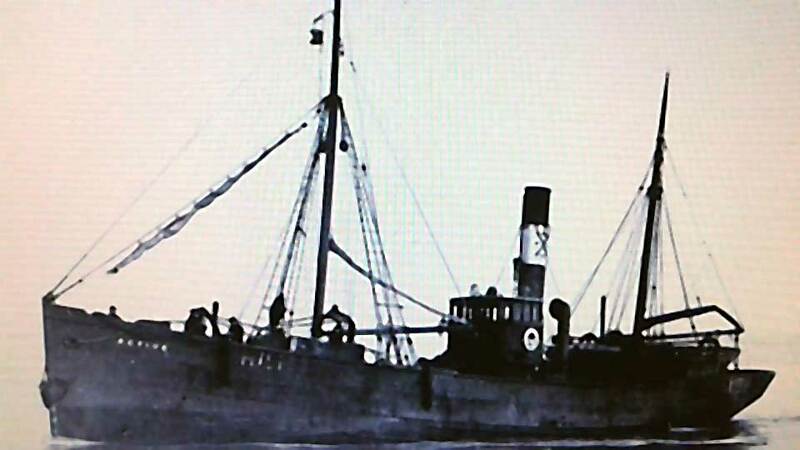 This entry was posted in Lost Vessels, Steam Trawlers, Steamers (Picture), War Losses and tagged Active FC, James Herbert Marr, Lost, War Loss on May 14, 2012 by Fred Smith. 1891: Launched by Cook, Welton & Gemmell, Hull (Yd.No.59) for The Hull Steam Fishing & Ice Co Ltd, Hull as TASMANIA. 17.1.1891: Registered at Hull (H122). 1.1891: Completed (Henry Toozes, manager). 21.11.1893: In the North Sea connected to the Swedish barque JOUEHELD disabled with main and mizzen masts carried away and crew member Carl Michelsen washed overboard and drowned. Delivered Hartlepool after a tow of twenty-one hours. 11.1912: Sold to James Herbert Marr, Fleetwood & The Active Fishing Co Ltd, Fleetwood (James A. Robertson, manager). 19.11.1912: Registered at Fleetwood (FD171). 1.1.1914: Tonnage altered to 60.12 net under provision of Merchant Shipping Act 1907. 6.10.1916: Sold to Horace Edward Stroud & Sydney Morris Cannon, Aberdeen. 3.11.1916: Registered at Aberdeen (A737). Horace E. Stroud designated managing owner. 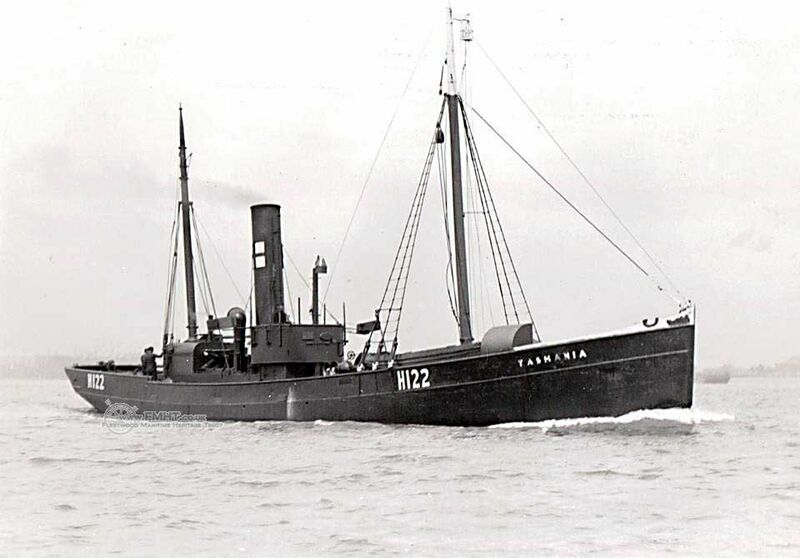 30.3.1918: Sold to James Johnson, Scarborough (trading as Scorpion Steam Trawling Co). James Johnson designated managing owner. 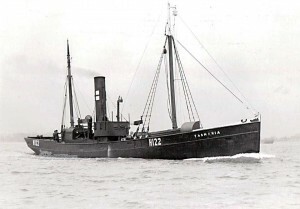 1918: Tasmania Steam Trawling Co Ltd, Scarborough registered as a private company with a capital of £9,000 in £1 shares to take over the “Scorpion Steam Trawling Co” including the steam trawler TASMANIA. Directors are J. Johnson, D. Chew, R. W. Crawford, R. M. Parker ad G. H. Cambridge, all Scarborough. 4.4.1919: Sold to Charles William Robinson, Redcar. Charles William Robinson designated managing owner. 1923: Sold for breaking up. This entry was posted in Steam Trawlers, Steamers (Picture) and tagged Active FC, James Herbert Marr, Marr on January 8, 2009 by Fred Smith. 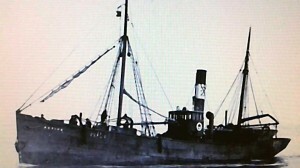 12.5.1906: Launched by Mackie & Thomson, Govan (Yd.No.331) for Anglo-Norwegian Steam Fishing Co Ltd, Hull as SOCRATES. 12.6.1906: Registered at Hull (H885). 6.1906: Completed (William R. Leyman, manager). 10.10.1912: Sold to James H. Marr, Fleetwood for £5250. 16.11.1912: Registered at Fleetwood (FD163). 7.12.1912: Sold to J. Marr & Son Ltd, Fleetwood (James H. Marr, manager). 7.1.1913: Homeward from fishing grounds (Sk.Philip Burman). In thick fog and drizzle, stranded on rocks in Clanyard Bay, Wigtownshire. 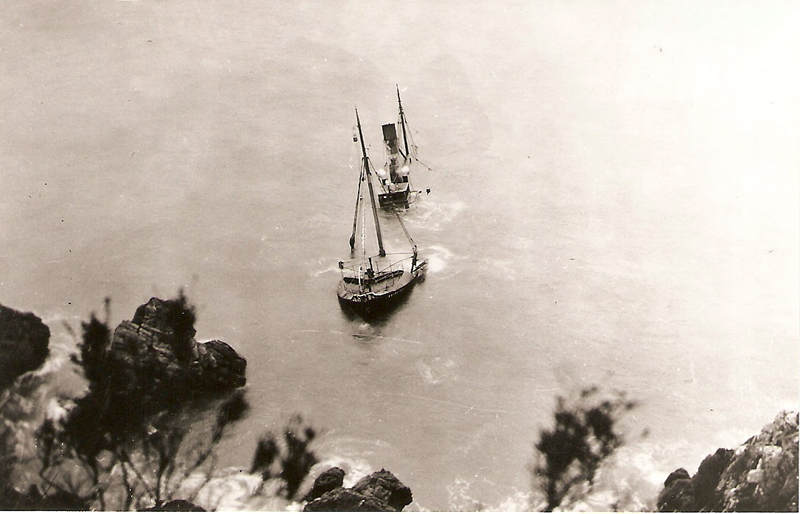 Crew of eleven scaled cliffs and made their way to Drummore. At high water slipped from rocks and submerged. 1.1913: Survey by Liverpool and Glasgow Salvage Association’s steam derrick barge LADY KATE (135grt/1881) indicated little damage but offer to refloat was declined by Hull Steam Trawlers Mutual Insurance Co.
21.1.1913: Fleetwood registry closed “Total loss”. Wreck stripped. 01/06/2017: Removed FMHT watermark from images. This entry was posted in Lost Vessels, Steam Trawlers, Steamers (Picture) and tagged James Herbert Marr, Lost on January 7, 2009 by Fred Smith. 22.10.1907: Launched by Goole Shipbuilding & Repairing Co Ltd, Goole (Yd.No.267) for Louis Cohen (64/64), Norbreck as ETHEL. 27.12.1907: Registered at Fleetwood (FD173) Louis Cohen, managing owner. 27.12.1907: Mortgaged to London City & Midland Bank Ltd, London (A). 21.6.1912: Sold to Phoebe Hoyle (64/64), Halifax. 21.6.1912: Sold to George E. J. Moody (64/64), Grimsby. Appointed managing owner. 24.6.1912: Sold to The Active Fishing Co Ltd, Fleetwood (James A. Robertson, managing owner). 24.6.1912: Mortgaged for £4500 @ 5% to James Herbert Marr, Fleetwood (B). 1.1.1914: Tonnage altered to 108.58 net under provision of Merchant Shipping Act 1907. 6.1915: Requisitioned for war service as a minesweeper (1-6pdr) (Ad.No.1595). Based Lerwick. 1919: Sold to Hf. Atlanta, Iceland (Elias Stefansson, manager). 12.1919: Registered at Reykjavik (RE237). 1920: Skuli Jonsson appointed manager). 1923: Landed salt fish from Iceland (£849). 1923: Sold to J. Marr & Son Ltd, Fleetwood (James A. Robertson, manager). 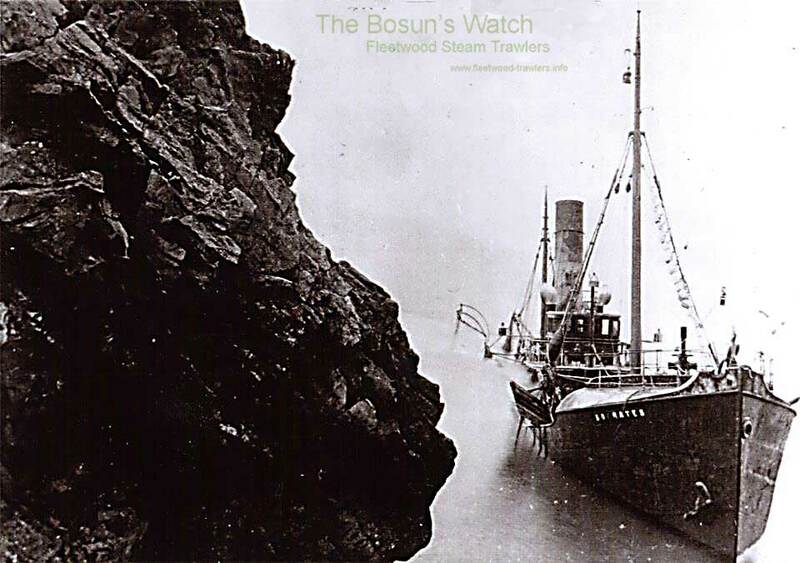 18.12.1923: Registered at Fleetwood as IRVANA (FD430). 5.1.1924: BoT approval for sale to Portugal. 1925: Sold to Comissariado Geral dos Abastecimentos, Lisbon. Registered at Lisbon as APOLO. 1.1927: Sold to Sociedade Comercial Maritima Ltda, Lisbon. Registered at Lisbon as CABO JUBY. 1958: Sold for breaking up. This entry was posted in Steam Trawlers and tagged Active FC, James Herbert Marr, Louis Cohen on December 19, 2008 by Fred Smith.